Earlier this week Hongoeka marae in Plimmerton was filled with the sounds of taonga pūoro (Maori musical instruments) – accompanied by the buzzing of sanders and the call of tuis flitting among the flaxes. I was one of twenty Te Papa staff who took part in a three day wānanga on taonga pūoro, tutored by members of Hau Manu – Richard Nunns, Brian Flintoff, Horomona Horo, James Webster and Warren Warbrick, with the assistance of Alistair Fraser and Henare Walmsley. Several staff from museums in the Wellington area joined us for the wānanga. 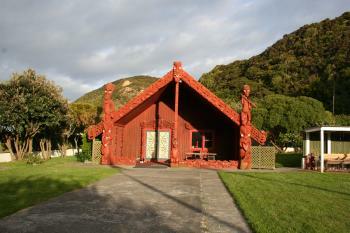 The marae at Hongoeka was a great setting for our learning to take place and we were warmly welcomed and looked after by the people of the marae. A beautiful sunset at the close of day one and the visit of several whai (sting rays) into the bay were signs that this was going to be a special time. 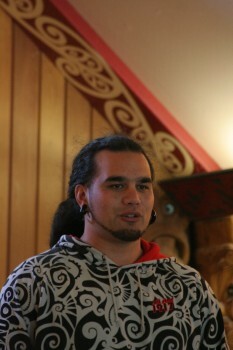 On the first evening we were introduced to the history of the wharenui Te Heke-Mai-Raro and the stories behind it. The design of the kowhaiwhai and tukutuku patterns in this house relate to whakatauki – expressing concepts such as whanaungatanga, turangawaewae and wairuatanga. 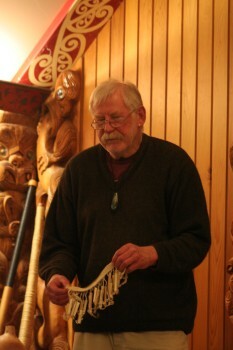 We then listened as Richard Nunns introduced us to the family of taonga pūoro instruments. The next day we divided into groups to spend time with each tutor. Richard shared his incredible knowledge of the different instruments and helped us as we started to learn how to play them. With each telling you get to hear new anecdotes and stories from Richard – he drops in fresh morsels of info and kōrero. 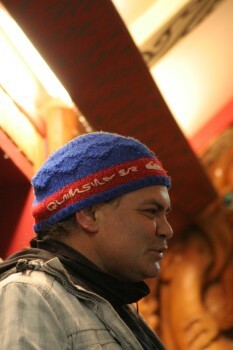 Brian Flintoff patiently lead us through making nguru, kōauau, pūtōrino and porotiti. For a year now I’ve had one of Brian’s pūtōrino. It’s been sanded and burnished for some time and I’ve been trying to find its voice. They say you have to perserve with taonga pūoro, and just a few months ago, I did find it’s voice. 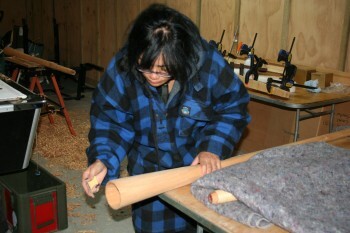 With Brian’s help at this wananga my pūtōrino now has its final carvings and bindings. James Webster helped us make and then play our porotiti and purerehua, skilfully and very generously decorating our instruments with wonderful designs. Horomona Horo challenged each group to compose a piece – to write our words and then add in the taonga pūoro. At first this seemed like an impossible thing to do – but inspiration came from the experiences of the day and our composition slowly took shape. 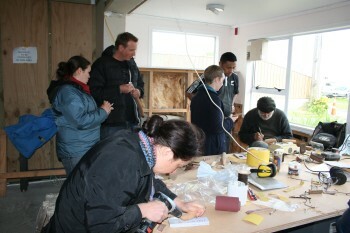 Meanwhile a small group of staff were taken through the process of making a pūkāea by Warren Warbrick. 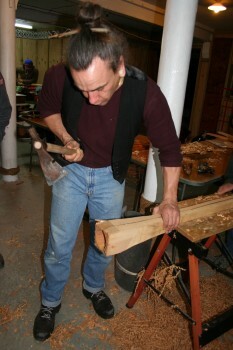 Cutting the timber, shaping out the insides and then crafting the final shape of these large trumpet-like instruments was a huge task – several people worked very hard, late into the night to get their pūkāea finished. At the end of the second day everyone joined together for the Pō Whakangahau, or evening concert. Using our new skills and knowledge we worked together to play our new instruments and make music. The magic and power of these taonga pūoro shone through – you could feel the warmth, the energy and the emotions. I was reminded of the power that music has to join people together and to touch you. This wānanga was a very special time. As Te Papa staff we were privileged to learn from our Hau Manu tutors. For me, and for others, it was a rich, moving, and restorative experience – it felt good to be filled up like this and to have your batteries recharged. Now our challenge is to work together and carry on our journey with taonga pūoro to bring their voices into our work at Te Papa. Thank you for your interest in our journey with taonga puoro here at Te Papa. We would love to talk more with you about how we could connect with your school. The best thing to do would be to contact our Education Team to begin with – ask for Riria or Julie. Contact details are on our website. Or feel free to contact me.